The Wiverns were vicious, bloodthirsty and extremely powerful creatures. Their legs were said to be the size of hundred year old trees that could squash entire crowds of people, herds of livestock and even village buildings. Their prominently blazing eyes were mesmerizing, terrifying and dominated their scaly, serpentine like heads. They could fly about in the sky with ease and attack anything they viewed as an appetizing snack or as a multi-platter buffet to kill and ingest without any thought or remorse. Claws were often part of their deadly arm-like wings and a deadly spike finished their tails to aide in their quests for feeding and destruction. On top of being able to expel fire from their noses, these dragons always had a breath that reeked of recently killed and devoured flesh, their bellies usually observed as bloated with obvious signs of a recent feast. These mythical beasts were exceptionally powerful and evil to the core so anyone who could conquer and kill one was deemed to be a dominant force and supreme hero. Depicting a trophy image in its likeness in any form, whether at the tip of a pirate ship or as part of a coat of arms; was indeed considered a symbol of extreme strength and superiority. Here is a drawing by NKirouac of a Wivern achieved using Manga Studio software. This version of the nasty wivern doesn' t have any menacing spikes at the tip of it's tail but it still looks angry and vicious. Below is the speed draw of this piece. To see how it came to life - take the time to enjoy the video. 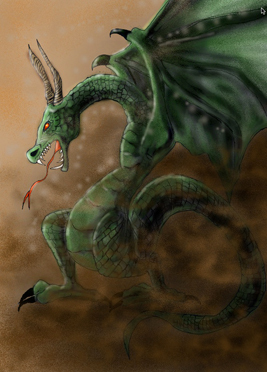 More speed drawing videos of mythical creatures can be seen on PixelartiFX. The background music was created by iGamrGeek TV. Reign of Fire - Starring Matthew McConaughey, Christian Bale, Izabella Scorupco & Gerard Butler. In this 2002 post-apocalyptic fantasy adventure movie - these destructive mythical dragons wreak total havoc amongst the England landscape in the year 2020. Below is a short video of the movie Reign of Fire where you can see these nasty fire breathing dragons in action. Video provided by iGamrGeekTV. Make sure to visit, "like", subscribe to our Youtube Channels or comment on this page using the form below - we would love for you to share and tell us what you think of our content.